According to expert estimates, as many as 80% of Americans overbrush, which means they’re brushing too hard. Overbrushing can be just as damaging to gums and enamel as not brushing at all. A University of Newcastle study on this subject showed that the optimum brushing time is 2 minutes with the pressure of 150 grams, about the weight of an orange. The study also revealed that you do not remove extra plaque by applying extra pressure or brushing longer. Also, there are more serious consequences of overbrushing. The main purpose of brushing is to remove the soft plaque layer from the teeth. Using a fluoride toothpaste allows the enamel layer to get stronger. However, when you apply more pressure or brush longer, you run the risk of wearing away your enamel. You cannot remove tartar from your teeth with brushing at all. That can only be done with dental cleaning instruments. When you harm your enamel layer by brushing too hard, you leave tiny grooves in your enamel which is actually very thin. Your teeth may become more sensitive and susceptible to decay and staining without a strong enamel layer. Sensitive teeth may affect the teeth around them as well with discomfort or pain if you consume hot or cold food or drink. 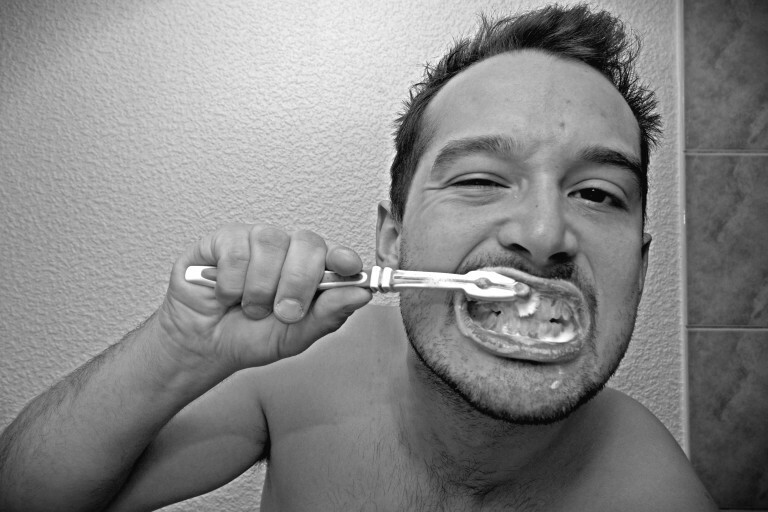 Brushing for a normal amount of time with moderate pressure doesn’t hurt the gums. But if you apply additional pressure or brush for extended periods of time, you may irritate or scratch your gums, and they will start to recede. Remember, gentle pressure is best. As mentioned already, the purpose of brushing is to remove plaque. You cannot whiten your teethby brushing longer and harder. On the contrary, if your enamel layer erodes due to excessive pressure of brushing, the yellowish layer below it called dentin will start to show through. Brushing twice and flossing at least once every day is very important to keeping your mouth clean and healthy between dental cleanings. However, too much of a good thing can also cause damage to your mouth. For more information about how to brush your teeth effectively or to book an appointment, call Flowers Dental now at 623-777-2924 or visit us at 3618 W Anthem Way #D132 Anthem, AZ 85086.